TouchCopy does what it advertises: It transfers music, playlists, messages, photos, and videos from an iPod, iPhone or iPad to a PC or Mac computer. It has a rich feature set that makes moving your files from your iOS mobile device to your computer easy. And while it's not perfect, it's a comprehensive solution to getting files from your iOS device onto your Mac or PC, and could be just the thing to get you out of a jam. TouchCopy is designed to help you transfer files from your iOS device to your computer. But wait, you may be thinking, can't I just do that with iTunes? Yes, but not as comprehensively as with TouchCopy. 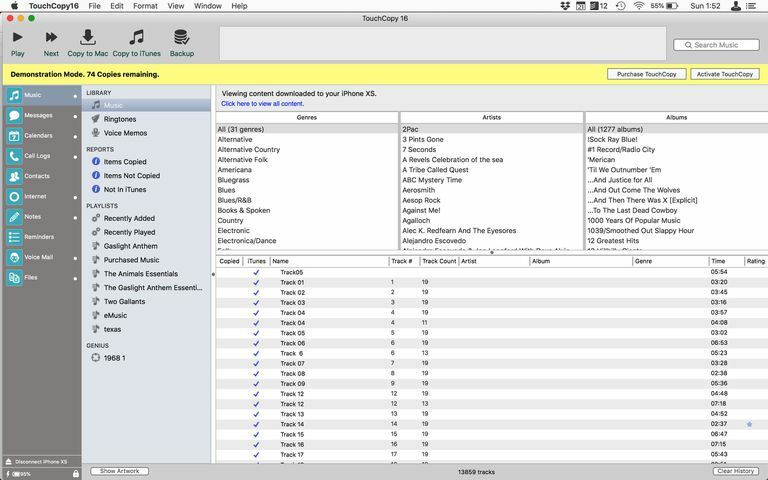 Sure, iTunes can help you move music back and forth, but TouchCopy can do so much more. First off, TouchCopy can help you view all kinds of files from various apps all from one computer program. Whether you want to view text messages, text files from Notes, the contents of the Reminders app, listen to voicemails in the Phone app, and much more. Then, you can also transfer all of these kinds of files from your iOS device to your Mac or PC. In that way, TouchCopy is a powerful tool for making backups and extracting just a few files from your device that might otherwise be hard to locate. TouchCopy is particularly useful when you lose a computer hard drive or get a new computer, and it doesn't contain your music, images, contacts, messages, and photos. Just install TouchCopy and connect your iPhone or another iOS device to the computer. TouchCopy prevents the computer from syncing with the iPhone while the software is running and allows you to select the media you want to copy. After you download and install TouchCopy to your computer and connect your iOS device using USB or Wi-Fi, the TouchCopy interface lists all the types of content that you can transfer from your iPhone, iPod, or iPad in a panel at the left side of the screen. Select a type of content, such as Music, and choose Backup All to copy all your music to your computer, or select only some of your music files and click or tap Copy to iTunes. The left panel of TouchCopy includes listings for the types of content you have on your mobile device. Most iPhones, for example, contain categories for Music, Photos, Books, Messages, Calendars, Contacts, Call Logs, Notes, Voice Mail and other categories. Click any category to view specifics about the content in the main window. Make your choices and use the options at the top of the screen — Copy to PC, Copy to iTunes, or Backup All — to initiate a transfer to your computer. In our testing, TouchCopy was able to perform all of the actions it claims to and, generally, performed them well. TouchCopy could connect to our iPhone XS by USB and Wi-Fi, though the Wi-Fi connection failed on the first attempt and was definitely slower than the USB connection overall. Transferring 25 songs from an iPhone to a Mac took about 5 minutes. That felt a little slow, but another transfer of a single song took less than 10 seconds, so it seems that the speed of the app is a bit variable. On the downside, TouchCopy isn't able to transfer songs that come from Apple Music (those require a valid subscription to play anyway) and transferred songs don't come with star ratings or play counts. That's not a deal breaker, but if you like to curate your music library very closely, that may be important to you. Beyond transferring music, TouchCopy can play voicemails (even those in the deleted folder), view your iOS device's browsing history and load pages in a browser within the program, and give you access to browse your iOS device's filesystem, which is not normally available to iPhone or iPad users. Windows: TouchCopy for Windows is compatible with Windows 10, 8, 8.1, 7, and Vista with Apple iTunes 10 or higher. Microsoft .NET Framework Runtime is necessary in some cases and can be downloaded directly from Microsoft. The installer tells you if you need it. Mac: Mac OS X 10.9 Mavericks or higher is required. MacOS Mojave is supported. An Intel-based Mac is necessary with iTunes 10 or higher. iOS: TouchCopy works with all iPods, iPhones, and iPads and is compatible with all iOS versions including iOS 12. The software has been tested with iPhones 8, X and XS. All iPads to date are supported, as are all iPods including the old Clickwheel versions such as the Classic and iPod Mini. The iPod Nano and iPod touch are also supported. TouchCopy 16 is available as a free trial download for both Macs and PCs directly from the Wide Angle Software website. However, the trial is severely limited by restrictions (you can only transfer 100 songs and can't transfer some kinds of files at all, for example). Purchasing a license removes all restrictions. Licenses are for a one-year rental (US$29.95) or a lifetime purchase ($39.95).